Journal of Applied Biomedicine promotes translation of basic biomedical research into clinical investigation, conversion of clinical evidence into practice in all medical fields, and publication of new ideas for conquering human health problems across disciplines. Providing a unique perspective, this international journal publishes peer-reviewed original papers and reviews offering a sensible transfer of basic research to applied clinical medicine. Journal of Applied Biomedicine covers the latest developments in various fields of biomedicine with special attention to cardiology and cardiovascular diseases, genetics, immunology, environmental health, toxicology, neurology and oncology as well as multidisciplinary studies. The views of experts on current advances in nanotechnology and molecular/cell biology will be also considered for publication as long as they have a direct clinical impact on human health. The journal does not accept basic science research or research without significant clinical implications. Manuscripts with innovative ideas and approaches that bridge different fields and show clear perspectives for clinical applications are considered with top priority. 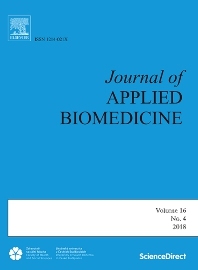 Journal of Applied Biomedicine is the official journal of the Faculty of Health and Social Sciences of the University of South Bohemia, Ceske Budejovice, Czech Republic.